As the date draws closer for the release of my new Regency-period historical romance, I find myself most anxious to hear the audio version. 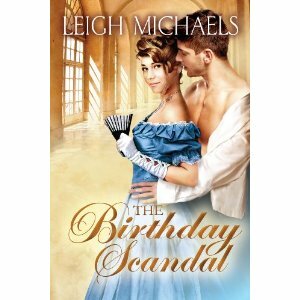 The Birthday Scandal is my fourth historical romance... my 84th romance novel... at least my 105th book... but the very, very first which will be released as an audio book. A few weeks ago, when the book was being recorded, actress Rosalyn Landor and I had a lovely conversation via email to talk about accents. One of the three heroes in the book is American, and she asked where he was from, so she could make him sound just right. Rosalyn is an experienced narrator and I can't wait to hear how she shares my story about the three Arden siblings (Lucien, Isabel, and Emily) as they find love at their great-uncle's 70th birthday ball. In the meantime, I'm in production with four more audio projects. Creating Romantic Characters will be out soon -- it's a non-fiction book about building characters from the ground up. It will be followed by Wedding Daze, which is a Regency short story (it'll only be about a half-hour long, though I wish it was more -- the narrator has such a lovely accent!). The other two projects are contemporary romances -- The Best Made Plans and The Lake Effect, which will probably be coming out at the beginning of next year. Of course the narrator has the really hard job in this enterprise -- I've done enough radio spots in my time to have a great appreciation of the work they do. Still, I'm finding that the producer doesn't have an easy time of it, either. Part of my job is to listen to each book all the way through -- sometimes multiple times. While that sounds like fun (and indeed it is) it's also a challenge to stay completely alert in order to catch a wrong word or an unclear phrase, and then get it noted down quickly with the exact time spot in the recording, so it can easily be redone. Not at all like listening to a book for fun! A whole new set of stresses! I think it'd be easier for dyslexic-girl-me to pick up mistake-words when spoken but I'm not sure I wouldn't get distracted by something shiny and stop paying attention. Good luck! Is your Characters book out in paper form yet? I love craftbooks, and On Writing Romance will forever be a goto for me. Hi, Amalie! Thanks for stopping by! Yes, audio is an entirely new set of stresses. It's tougher because I'm just not good at sitting still and concentrating -- I want to be doing something! Audio books-how exciting! I didn't realize so much effort was involved. Good luck! I can't wait for your new book to come out. I keep checking B&N to see if I can pre-order my e-copy. Sigh! Still not there. Let me know when it hits.